The ambitious MMORPG Star Wars Galaxies shut down servers in 2011 but the fan run servers of SWGEmu keeps an old version of the game alive. There are countless players still enjoying a game that officially died years ago. What brings people back to the galaxy far, far away after all this time? The emulated servers are well maintained by fans who have recreated the game using unique code, carefully avoiding any of Sony Online Entertainment’s propriety inventions. The team behind it had test servers running before the original game even shut down. It was a passion project by fans seeking to recapture the old game before major changes by SOE radically changed its direction and tone by removing a host of systems and features in hopes to save the dying game by appealing to a wider audience. Passion is the right word to describe the fans of Star Wars Galaxies. To understand the game, you need to understand those fans and hear their stories. Everyone has a history. For instance, in the initial days of the game, I managed to get my hands on a powerful carbine and some decent armor very early and became a desert guide. Charging half upfront and half on safe arrival, I guided players from Mos Eisley to Jabba’s Palace. I timed the trip in SWGEmu, following familiar desert paths. It took over thirty five minutes. I would make multiple trips per day. Star Wars Galaxies allowed people to create interesting identities explicitly because of its convoluted tangle of systems. There were over thirty jobs and a detailed faction systems that helped players define who they were. Arriving in Mos Eisley as a medic this time around, I encountered a bounty hunter named Zaxen Highwind. Zaxen was the first player I encountered in SWGEmu. Zax was returning to his previous galactic life as a bounty hunter once more but other players had different experiences. My first patient in the medical center was Darguli. He towered above my medic, making me feel incredibly small. But he had a big heart that quickly won me over. A key feature of Star Wars Galaxies was that the majority of the game world was formed by players. The economy was all player run, with artisans and crafters putting gear on the market. Once implemented, player cities began to sprout up on planets. Player stories intersected in unpredictably ways. Perhaps Darguli had once saved a Jedi from Zax. This was the magic that most players were trying to recapture. The cantina was lively and full of players. 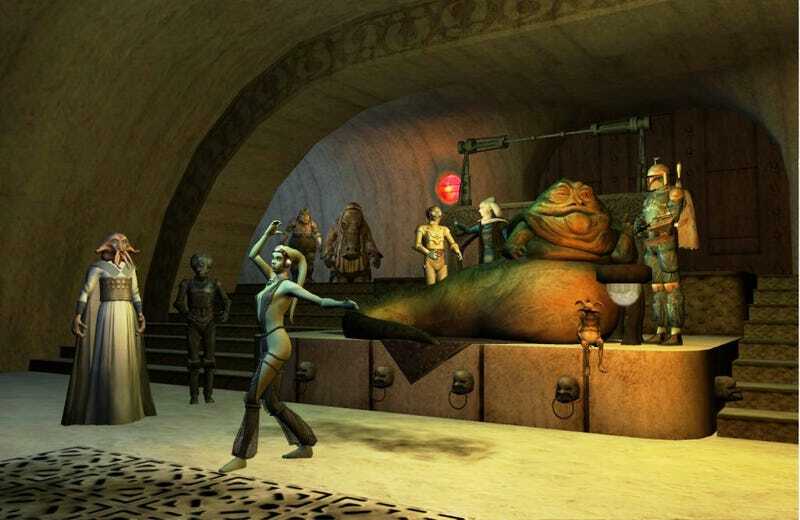 I found the city’s cantina full of dancers and musicians. Some were AFK and running well written scripts to automatically ply their trade and buff adventurers. Others were interactive and talkative. Plenty of people sat in the cantina, eager to talk about old connections and excited to seek out new ones. Many were trying to reclaim the past. I met a fighter ace named Spiriana who was trying to find the familiar comfort of squadrons and fellow pilots that had help them to relax so much back when the real game was running and they were actively serving in the Marines. They eagerly told me stories of hectic battles in space. Strand was a violent man who seemed to be attacking gang of helpless Jawas in frustration. He wanted to rebuild his old guild but couldn’t find his friends after losing his first character on the server for reasons he wouldn’t specify. Some players were more successful in finding connections. A kind doctor named Chaika guided new players around town, greeting them kindly. They always ended up back in the cantina to relax and talk with their new friends. A tiny Bothan named Rayven was playing on his wife’s character; they played the game together most of the time and were eager to recapture the thrill of old adventures once the character was leveled up. Me, with some of the citizens of Savereen. SWGEmu also has well established communities. These player run cities take many different forms. Some are cosmopolitan in nature, offering the best wares from high tier crafters. A majority function as guild run bases of operation. Smaller ones cater to more particular niches. Savereen is a reclusive town on Rori. Rori is a moon of Naboo, the planet where much of The Phantom Menance took place. It’s out of the way and you have to take multiple starship journeys to get there. It is a paradise for roleplayers who were eager to tell me how Star War Galaxies offered ways in which they could express themselves. Many were eager to tell me about their characters’ misadventures. The player who caught my attention the most was Harby Blum. He was a shorter man with receding hair who wanted nothing more than to be a chef for the town. His friends had taken to calling him the “Cupcake King”. “You can do whatever you like in SWG when it comes to your career,” Amillo added. The party eventually left to grab a virtual dinner at a local dining establishment, chatting in character and enjoying each other’s company. They had old memories of the official game but were forging new ones here and now with their vibrant characters. My home wasn’t there but it was still beautiful. Out of curiosity, I traveled to the planet Corellia and hiked out to where my house was in the real game. It rested at the intersection of two rivers. Of course, it wasn’t there. That house was deleted long ago when my own server was taken offline. But the land was familiar. There was something nostalgic in the trees and the flowing water. I looked around at the vast world and wondered if I could maybe rebuild my old home once again. I wondered if I, like the players I met, could find something long since lost. I think I might try it for myself, hopefully leaving a new mark on a different version of a galaxy far, far away.